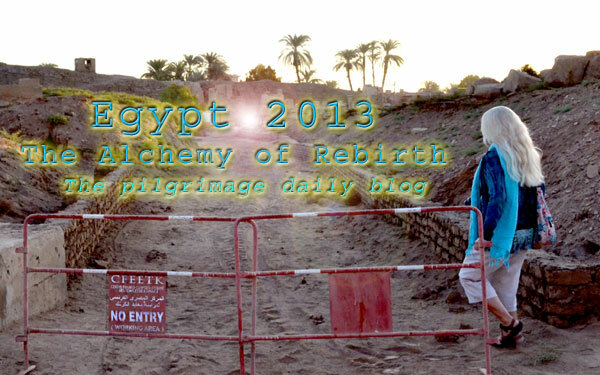 If you have not been following us on Facebook at https://www.facebook.com/alunajoyyaxkin this is what we were posting over our recent 2013 Egypt pilgrimage. This is just a wee little bit of what we experienced in Egypt. The full messages will be coming soon along with 4 new essences! Buddha says, regarding sacred pilgrimage, the greater the challenges, the greater the blessings. I can't remember when was the last time that I had so many unusual obstacles prior to a pilgrimage. All I knew was that once I boarded the plane that it would be all behind me. Others in our peace team had many odd challenges as well. I can see that reality is morphing around us into a new form. Nothing is as it was, or will ever be again. As we landed in Cairo in the pre-dawn light, I could feel a peace and harmony coming from the city below me. 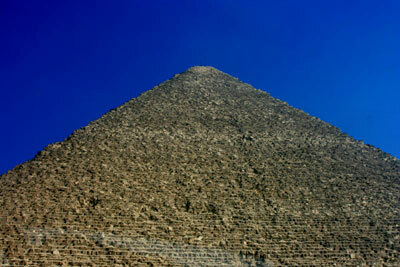 As we arrived at our hotel, the first sun was hitting the great pyramid, and the birds were beginning to sing. My soul is tired, yet newly alive . . . like when one has completed a marathon. We are entering the post 2012 era frequencies, and a new time and space is beginning to transform our reality. It is a time where nothing is as expected. We are questioning our very souls, as we are being stripped of any and all expectations . . . wiped clean and readied for things we cannot imagine. I have renounced all the fighting and fear of the passing era, and I am reaching for the rebirth of magic that is coming in some mysterious form yet known to me. We are beginning to find the eye of the storm . . . the golden needle in the hay stack. All I feel is gratitude for this opportunity, and I feel blessed by the presence of other brave and trusting ones that make up our circle of visionaries who have had to LET IT BE to be here NOW. We come here with open hearts and ready for magic. It was the grace of the creator that we are energetically invisible and by chance our entire itinerary was reversed at the last minute, (it was the way I wanted it in the first place ). So literally no one knew where we were. We are blessed to have our Facebook family from all over the world watching our backs for us (That's you!). Thank you. Thank you. We can feel your support all around us. So the journey begins; yet it echoes of another time when we were stalled, but are now beginning again; like the anticipation when one starts up an old classic car. It feels like an ending, yet a new forward movement is taking hold. Tomorrow we take our first steps into the unknown. I ask Spirit for clear vision and clear communication of frequencies received. Oct 6th - Egypt's freedom day. 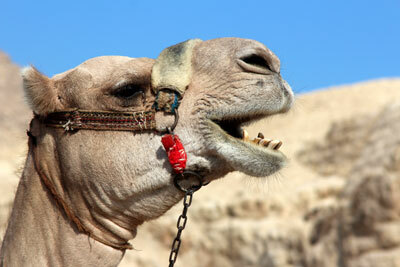 After two days on solid land here in Egypt, the fuzzy, out-of-body feeling persists in me and in many in our group. It is like our body is going to sleep, but our consciousness is staying awake and aware. This symptom began around the first of September. Food does not seem to ground us, and it only makes the symptoms more intense. We are having to be extra careful to be aware of our physical reality and not lose things like passports, etc� and to not walk into walls. We are asking questions like "Is this is what it will feels like when we ascend? ", "Are we now picking up where we left off after the fall of Atlantis? ", and "Is it all about to happen?" Oddly, I am very apathetic about the whole deal at this point. Maybe we just need to let it all go . . . To go! The Beatles song "Let it be" runs through my head. All I know is that it is hard work to stay in my clunky, 3D body that seems to be very confused and conflicted by the current energies. 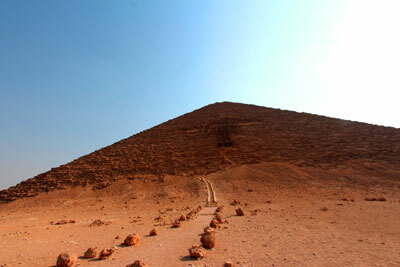 Today we will head out to a new pyramid that we have not been to before that is out in the silence of the desert. This is also to avoid Cairo's infamous Tahrir Square where Sunday demonstrations are planned. We drove out to the pyramid site of Dashour, and entered the Red Pyramid and circumnavigated the Bent Pyramid. We connected with a guardian that was in the Red Pyramid. He/she had been there a very long time and allowed us to feel what was anchored deep in the earth hundreds of feet beneath the pyramid. It had to do with grounded, heart energy; but he/she also explained that we could not understand the enormity of this at this time. There is much there to decode. We think gravity was extra dense inside this pyramid as we all had major rubber band legs after we exited the pyramid. Last night Raphael and I could hear the army doing its hard job of protecting Egypt from the Muslimhood. This morning it was sobering and enlightening to see the city move forward, like business as usual, after last night's events. This is a way of life for them now. They don't go into fear; nor do they let a few crazy extremists affect their lives. This is a life lesson for all of us. After overloading with the huge archaeological collection in the Cairo Egyptian museum, we are now waiting in the Cairo airport as the WiFi signal teases me with 4 bars but no uploading to Facebook. P.S. We had the whole museum nearly to ourselves, and we felt totally safe surrounded by armed and fully staffed army tanks and jeeps. We are heading to Luxor and the Nile. Maybe the water will help us integrate and ground. I hope so, because I don't think I could pass a sobriety test while spinning half out of my body. Seven days on a glorious private sail boat will be a huge shift from the crowed city with more people than the entire population of Australia. At every turn, we are showered with love from the Egyptian people. 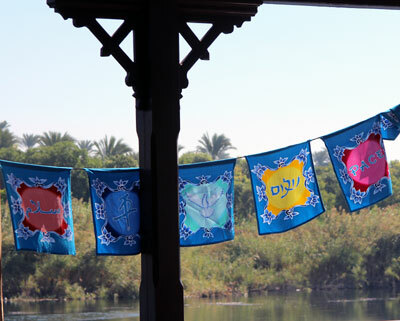 I can't do justice in sharing the feeling of peace that I have waking up on the Nile, in the pre-dawn light, to a dozen mosques breaking out in synchronistic morning prayers. There is nothing that conveys the love that resides in Egypt better than giving thanks to God several times a day. 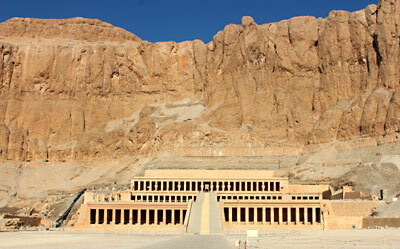 We visited the Hatshepsut Temple today and received a very sweet download of new heart energy. The best that I can describe it is as an energy/frequency of a new science/alchemy of heart that will be the core of a new world that is re-birthing as we write this. If you are called to do so . 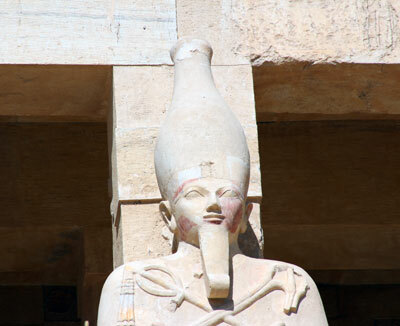 . . invite the goddess/pharaoh Hatshepsut into your heart and ask for the untouched, pure and completely new heart seed into your heart. As the sun sets, the moon and Venus are displayed in a great alignment in the night's sky over our little sail boat. Today . . . I returned home. After a good night's sleep on the banks of the Nile, we bussed to my favorite site in Egypt: The goddess temple of Dendara. I simply belong here. There are 96 huge Hathors in the first chamber alone, with 24 in the next chamber. I have not counted them all . . . there are just to many. 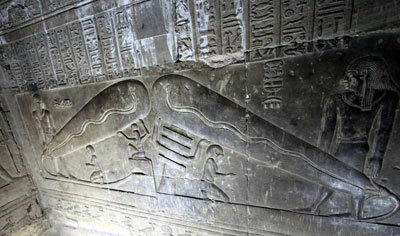 Goddess Nut graces the ceiling in several rooms, and Dendara is also the home to the rare Dendara zodiac. Nothing I can say will touch the impact that today had on our hearts and souls. The message was powerful. We were surrounded by a huge group of loving Hathors, Goddess Nut, Horus, Sekhmet, Thoth, Mother Mary, like I have never seen her before, and more. After an introduction to new world energies in a Hathor side temple, we descended into the small, rare chamber from the old kingdom. Again, Spirit graced us with a totally private visit. The guards also backed away, and we had just enough time to download a huge influx of energy. We also made a new alchemy essence from Thoth. We cried sweet tears, got over our fears of claustrophobia and had us a good sweat in the quite warm, little underground chamber . . . an Egyptian sweat lodge. 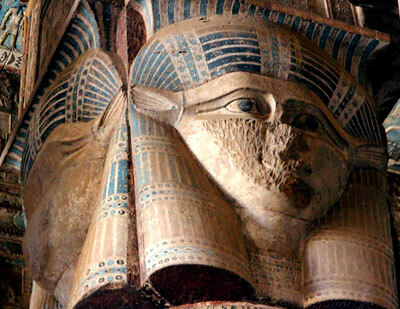 :) The carving and art is in pristine condition here in this old kingdom chamber, and so is the energy. We returned to our home on the Nile, our sail boat "The Afandina", and we crashed for some rest before we headed out to Luxor Temple at sunset. 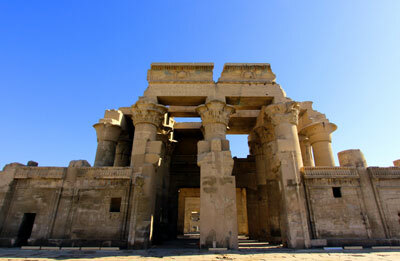 Our bodies toured the temple, but our hearts were still in Dendara's old kingdom. 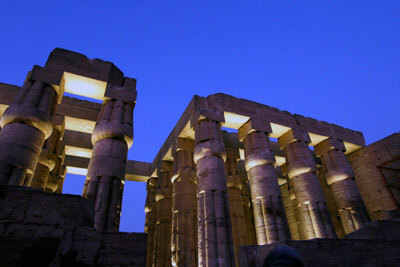 Sunrise in Karnak Temple is stunning and incredibly peaceful. 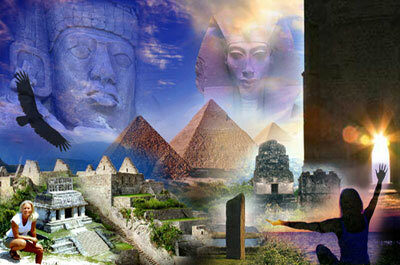 The site was anchored by Ascended Master Serapis Bey, and is the home of the Great Goddess /Mother Sekhmet. We were allowed into the inner most sacred chamber/temple of the Mother Sekhmet. 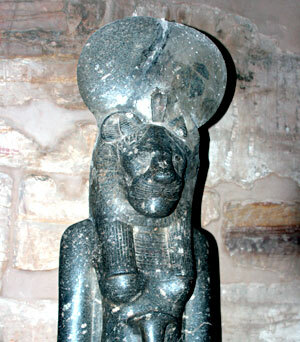 It has been her home from the beginning, and her statue is one of the few artifacts that is still in its original location. Many Ascended Masters, Atlantian Priests and even Anna Grandmother, Jeshua and Mother Mary have worked in this humble temple. 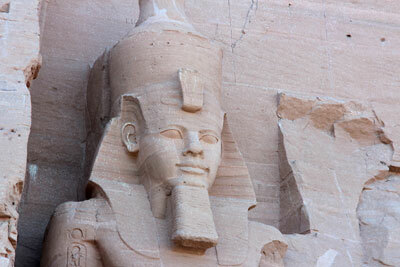 Because of this, the energy is quite powerful, and its energy has not been altered for many centuries. We had a small window of time before the director of the site arrived. When we entered the tiny chamber, in nearly total darkness, the energy roared into us with all the uncompromising qualities of a fully empowered mother/creator. There was an incredible amount of deep unconditional love, but it was laced with a humbling request for living impeccably and to have deep respect for her. This is a mother you would not want to cross. She could level you in a heartbeat if she wanted to. But we came in silence and with respect. Thus she showered us with priceless gifts; these gifts being the full-on power and love of the lioness mother. This is the power that will protect the Earth and all her children at any cost. Just by her presence she commands respect, impeccability and truth. It is an energy that can complete the most challenging work, and the work is done with a tenacious energy that keeps on, does not waiver, and reaches the spiritual goal no matter how challenging or costly. She said we must defend Earth and her children with impeccable justice and fairness . . . laced with gentle love. It is like the lion who walks gently on the Earth, but when crossed, can access its swift lioness power to put things back in order in an heart beat. Like I said . . . you would not want to cross this Goddess at any cost. We gave her love, and she kneaded us into soft putty. We floated out of the site and sailed the rest of the day to integrate this precious energy. We did get to make an essence here, and yes, we had thousands of orbs once again! 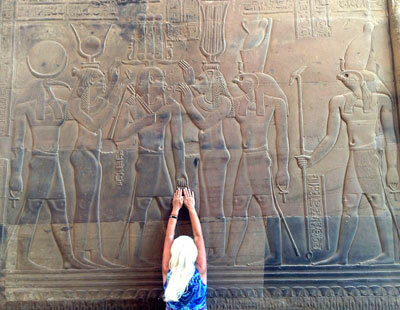 We are still traveling on the sacred Nile, and our bodies are detoxing and being reprogrammed with new frequencies. The energy here is so pure due to the complete lack of other tourists. We really do have the country to ourselves. What a blessing. Today we visited Edfu . . . the Temple of Horus (the Falcon God). Horus is also a manifestation of the great protector of the light . . . Archangel Michael. 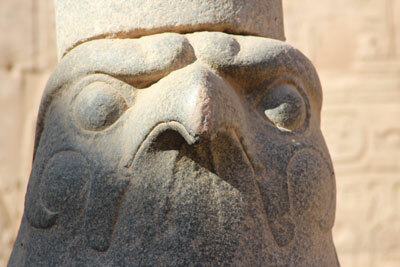 Over centuries, Horus has conquered and continued to quarantine the darkness at this site by gaining victory over Set. For the last few pilgrimages, I have watched our group's energy drop dramatically after a visit to this site. So I do not enter this temple lightly. BUT . . . there has been a huge shift in this site from when we were here 18 months ago. It is perfectly clear that the past has been locked behind us, and dualistic forces are now literally being starved as they are not receiving any energy from us anymore. This old, mis-qualified energy will be recycled to be used in a new and better way in the future. We expect that this shift will have a global impact. Why? Today we still use much of our energy to fight the darkness/negatives/polarities. It has been necessary for the times that we have lived in. This has used up valuable energy that we could have used to create other options and ideally build a new and better world. Now we will have more of our life force available to us each day. Now we can create other positive and unified options to replace old repeating patterns. So ask yourself today "What am I still fighting? ", and "Do I still need to do so?" Instead of fighting/protecting/defending, what if we all decided, as a family of like-minded souls, to create an alternative choice and offer the emerging world new options to old patterns? What would you create today? We left this site quite uplifted and joyous. Whew! That was a relief. 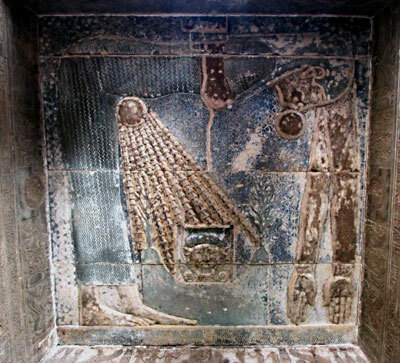 Horus appeared several times as a circling falcon above us. Thank you Horus. We have had a full day, meditative sail, and the Nile is totally to ourselves. As we glide on the glassy blue water, we feel like we are flying . 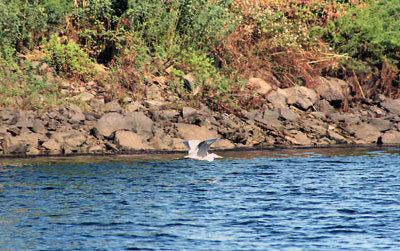 . . like birds, gracefully skimming the surface of the water. But the grace and harmony is deceptive as deep processing has taken place on our lovely, sailing, time machine. We have had some deep letting go, powerful conversations, and hilarious and heated discussions about life and relationships in Egypt . . . as we discover that life is the same no matter where you call home. Thank you Hatem and Doaa (our Egyptian guides) for the entertainment and the deep lessons. The joke today is . . . There is no denial on the Nile! LOL. Also, thank you to all of you who are still holding us and Egypt in the light and are sending us loving support. You help us keep going. 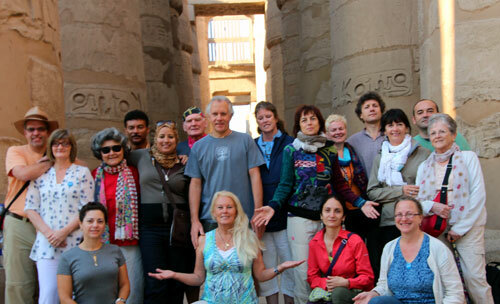 And we are sending you some wonderful, loving, Egyptian energy right back to all your hearts. It is almost like you are here with us . . . and we wish you were. 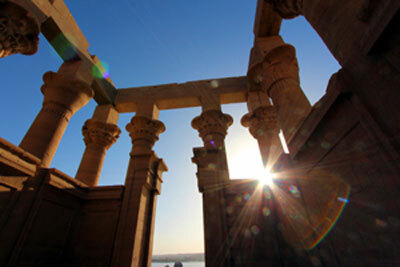 The healing Temple of Kom Ombo is the only temple that transduces and intensifies energy as you enter into either side of the double alter . . . A double holy of holies. It aligns and harmonizes your personal energy and even balances community energy. It is well known for healing and for its famous crocodile initiations. But today, the site said that what the site was built for is not needed much more, and is rebooting for a new purpose. We can hardly wait to see what that is. . . . Coming next year! We all received different experiences on this day. A few people had healings and deep connections, and one person was even invited to re-experience the heart pounding croc pit. But most of all, we just felt loved and harmonized. The site was all ours as we connected with a special healing wall. Even the guards joined us. In the predawn light, it is easy to forget if we are gliding on the water or sailing through the stars. 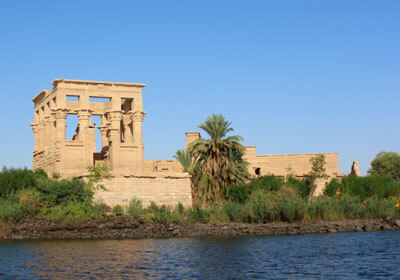 The Island Isis Temple of Philae is ahead, and its silhouette is barely visible in the moonless sky. In this moment, it is as it has always been. It is easy to turn back time and see ourselves here as initiates or pilgrims. I feel the presence of the three Mary's already entering the temple. This is a surprise. Once we landed on the island, we walked straight to the center, the holy of holies, the inner most sanctuary. 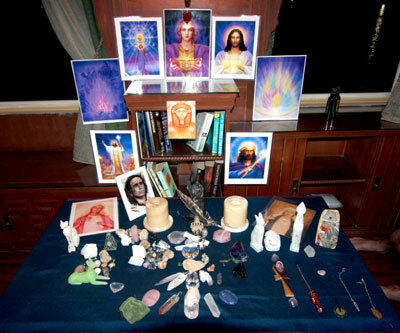 We set up our alter, and we began to tune in. It took quite a while to reach the core of the message. It was shared in such a way that I had to look and search in a brand new way. There was something important that they wanted to share. It was a long, hard dig . . . deep spiritual excavation. We will post the full message ASAP, but in a nut shell, we learned this . . . The inner chalice has evolved into one that is not a journey of the ONE, but of the WHOLE. All life on Earth is part of this new Chalice. The Chalice of ONE. Individual manifesting in this physical world is becoming a global venture. We received a golden flame initiation from the Immortals. We received wisdom codes from Thoth, creation codes from the Hathors, love and power from Sekhmet, and protection from Horus. We became beings that were on fire but were not consumed by it. There was much more shared but I cannot do it justice here. Thanks to Raphael for being ever ready with the voice recorder. We walked out of the temple in the new day sun. It was surreal. In the afternoon, we went to the bazaar via a felucca ride navigated by a Nubian sailor. We were his first customers in a month. We walked through the shops, and most of the vendors there were shocked and surprised to see tourists. 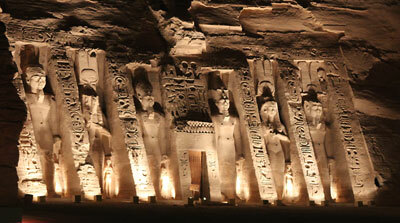 We drove through the Sahara desert for three hours to arrive at Abu Simbel on the shores of Lake Naser. 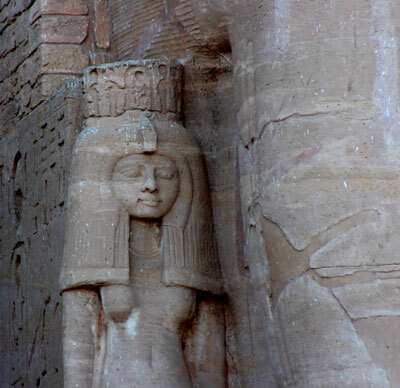 Two temples are here: One for Ramses II, and one for his Nubian Queen, Nefertari. 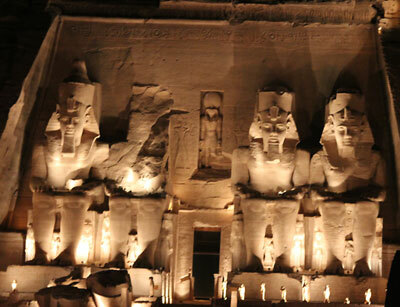 We first visited the four creation gods in the center of the Ramses Temple. They downloaded us with the creation codes of the four directions, and we became the fifth element . . . ether. This explains the woozy feeling that we have been having. We then walked the four chambers on either side of the holy of holies. Then we walked a fifth chamber and a last one that was unfinished. 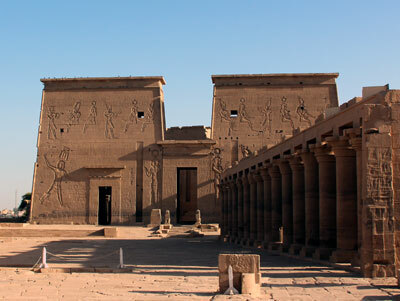 We then entered Nefertari's Temple and had a great surprise. Over the years, we have not felt much coming from this temple, but that has all changed. The Star Elders said that the energy would shift in sacred sites in 2013, and that is proving to be true. The center chamber . . . The holy of holies . . . was blasting energy so strong that it was felt by everyone. We stood and received, and also realized that a dimensional door was cracking open here. I could hear a new language, but I did not have the luxury of speaking it . . . guards were very nearby. Also, no photography was allowed from inside the temple, so I can't share this with you either. I was so blown away by the energy that I forgot that my iPhone was in my bag to sneak a photo. Dinner was quiet this night, and we all rushed to bed exhausted and deep in the throws of integration. Many of our group had wild and strange dreams. 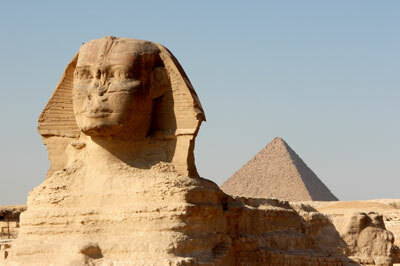 Tomorrow we are off to Cairo for our finale in Giza in the King's Chamber. With the constellation Orion overhead, we began the climb up into the King's Chamber of the great pyramid of Cheops. The King's Chamber was hot and claustrophobic. We turned out the lights to connect deeper with the energies and to see with our hearts. For the first few minutes, I wondered if we would be able to stay in the chamber for the entire two hours. Sweat streamed down my face, and oxygen was sparse. Then it all began to change. The chamber cooled, and the air became lighter. We are seeing a physical trend in temples here. The temples, that are usually a nice reprieve from the hot, Egyptian sun, have become ancient saunas; then they quickly cool as we absorb the energy. We have been told that we are being purified by a golden flame that does not burn . . . but raises our frequency. This has happened over and over again at various temples that we have visited. We will surely return home much different than we began . . . But that is the reason for pilgrimage, yes? If we came home the same, then we were just tourists, and not pilgrims. In the King's Chamber, after much soul retching prayer for my sorry human soul and asking for the death of my ego, my prayers changed, and I found my heart going to our group and all those that are following our posts. After all, we did not come here (Earth) just for self-serving purposes. We are servers of the light, and what we do, we do for every living thing. We do this if it is understood or accepted by the outside world or not. We are dedicated to global awakening. It is what drives us to keep on keeping on. As servants of the light, coming to Egypt at this time is like hitting the spiritual lottery for our divine purpose. Tourists like to travel when it is peaceful. Pilgrim's like to travel to where and when their peace is needed. It was a calling of our spirits to come to Egypt at this powerful and crazy time, and why we are already planning to return. Then I began to see light. Orbs floated all over the pitch blackness. The ceiling of the chamber disappeared and turned into stars. I could see the light aura around my hands. The chamber was packed with the gods of Egypt. I saw Horus, the Hathors, Sekhmet, Thoth, the Immortals, Maat, the Star Elders, etc.... I had to breathe deeply a lot to integrate the incoming waves of energy. It was work and play all at the same time. They shared a prayer with me. This is the best that I can remember it . . .
Then the God's harmonized this inside me so it could be used only for the light. Then I could see my body light up. Once I had integrated this, then the prayer changed, and it became a prayer for every ONE. The prayer changed to . . .
... and then I could see our group all lit up in a brilliant, light blue aura, and I could see them as they really ARE and not in there human form. It was amazing to see them all as Gods! What a photo that would have been! So much happened in two, very short hours, so this has just been a quick review. It was deeply cathartic for me, and ecstatic as well . . . and darn hard to exit the building half out of my body. But I did. After leaving the King's Chamber, we then anchored between the paws of the Great Sphinx, and there were little words that we had at this time. We were cooked in the new fire of the alchemy of rebirth. As we headed for our bus, we had a chat with a delightful Egyptian family having their holiday in Giza. No doubt we were an oddity there among all the Egyptian tourists this day. It was the Holy Week of Eid. It is going to be hard to leave Egypt tomorrow. These last two weeks have felt like months of experience, and yet, it is over in a flash. Eid, is an important religious holiday celebrated by Muslims worldwide that marks the end of Ramadan, the Islamic holy month of fasting. The holiday celebrates the conclusion of the 29 or 30 days of dawn-to-sunset fasting during the entire month of Ramadan. This is a day when Muslims around the world show a common goal of UNITY! Thank you for holding space for us, our group and for mother Egypt. We hope you continue to do so. I thought this was going to be my last trip here, but I guess Spirit has other plans in mind. We hope a few of you will join us next time around. 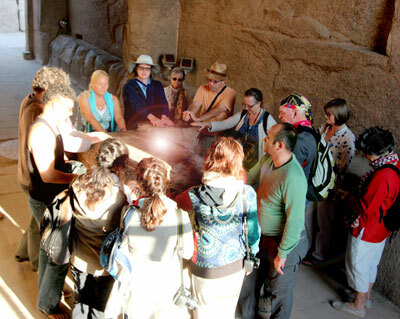 There is no better time than now to be in Egypt to employ your divine light in the highest service possible. We leave our hotel in the predawn light under a full moon rising over the Cairo skyline. It is still curfew in Cairo, so the roads are nearly empty. Tourism is exempt from the curfew laws, so the usual 1 1/2 hour drive to the airport took only 35 minutes. Spirit provides us in every way possible, and throughout our pilgrimage, we were kept in a safety net of energetic invisibility. On our way to the airport, we pass through a few friendly military army stops and are greeted with huge smiles from young Egyptian soldiers. We stumble around with our limit Arabic. One young man's smile went right to my heart, as we said in Arabic . . . "Salaam Alaikum!" (Peace be with you!). He smiled and returned the blessing to us saying "Alaikum Salaam."